Nivea Ad That Promises 'Visibly Fairer Skin' Sparks Controversy In West Africa : Goats and Soda The billboard and TV spot shows a Nigerian beauty pageant winner using a product called Natural Fairness Body Lotion. Critics are describing the ad as "colorist" and tone-deaf. The Nivea ad features Omowunmi Akinnifesi, a beauty pageant winner in Nigeria, promoting a lotion that promises "visibly fairer skin." Dove isn't the only skin-care company caught up in a controversy about its ads. Nivea, a German company with global reach, has been called out on social media for ads in West Africa that many described as racist, colorist and tone-deaf. The ads promote Natural Fairness Body Lotion, a cream that promises, according to the tagline, "visibly fairer skin." The social media storm erupted after the Ghanaian musician Fuse ODG posted the ad on Instagram this week. The ads themselves have been around for a few months. They first appeared on billboards in Lagos, Abuja and Port Harcourt, Nigeria, in June. Former Nigerian beauty queen Omowunmi Akinnifesi is featured, gazing into space, a sly smile playing on the sides of her lips. There's a TV commercial as well in which Akinnifesi's skin progressively lightens as she applies Nivea's product to her body. "I saw the Nivea ad once. It was after a long day, I'd been out on field assignments, and my skin had darkened by a shade, as it does when I stay outdoors for extended periods," says Ria Evbuoma, a medical doctor based in Lagos. "After the ad, I honestly took a look at my arms. I was darker, today. Do I need to be fairer?" This ad campaign subsequently was taken to Cameroon, Ghana and Senegal. There's been particularly severe criticism in Ghana, with several social media users calling for a boycott of Nivea products and for the ads to be pulled, using the #pullitdownnow hashtag. Ghana has had an ongoing conversation about skin tones — and lightening products — for a while now. Last year, the government banned creams that contain hydroquinone because of possible links between the bleaching agent and health issues. "The first time I saw the ad, I thought it was problematic," recalls Ayodeji Rotinwa, a journalist based in Nigeria. "Omowunmi Akinnifesi is not that fair to begin with. But in my opinion, for someone who girls look up to and isn't too fair or too dark, to then come out and say, 'fairer is better!' ... people already aspire to be like you." Akinnifesi, who first came into the limelight in 2005 after winning the Most Beautiful Girl in Nigeria pageant, has enjoyed public goodwill and is one of the leading faces in the country's fashion and beauty industry. She has yet to speak about the social media uproar. "What was wrong with Ms. Akinnifesi's skin anyway?" Evbuoma asks rhetorically. "I think that [the ad] strengthens the stereotype that happiness, fulfilment, career advancement and other positives are directly linked to skin tone." Nivea's response: "We have recently noted concerns on social media by some consumers regarding our NIVEA Natural Fairness Body Lotion communication in Ghana. We would like to emphasise that this campaign is in no way meant to demean or glorify any person's needs or preferences in skin care." The statement also said that the product is meant to "protect the skin from long-term sun damage and premature skin-ageing" and also address "uneven skin tone" — and that it is "every consumer's right to choose products according to their personal preferences." 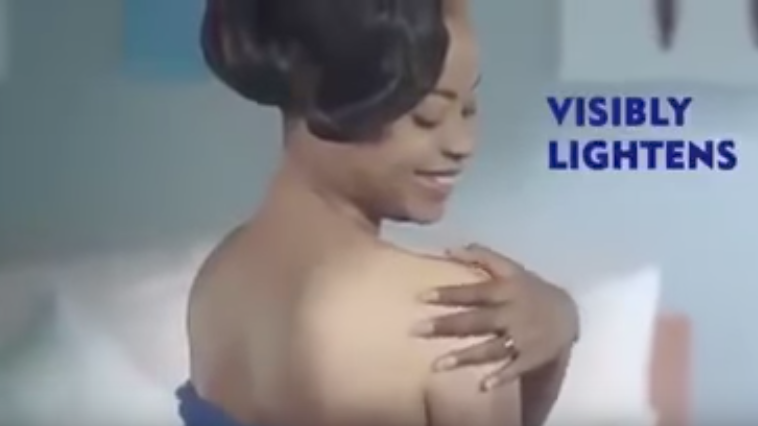 This social media criticism of Nivea's ad is part of an ongoing debate in Africa, where there is growing dissent against skin lightening products, popularly called "bleaching creams" in Nigeria. But unlike the Dove soap ads, in which a black woman took off her shirt and morphed into a white woman, critics don't necessarily use the word "racist" to describe the Nivea campaign. In the countries where the ads appeared, nearly everyone is of the same race. So the term more often used was "colorist" — an attempt to perpetuate a belief that light skin tones are better than dark skin. For some Nigerians, "good skin is usually fair skin," says Rotinwa. "It is sort of an indirect colonial legacy, a byproduct of colonialism." And if you think that "power belongs to people who are fairer, who are lighter, why not then look like them?" There's even a word in Nigerian slang, Rotinwa says — oyinbo – that can mean anything from a light-skinned person to a Caucasian. "Oyinbo is supposedly better," says Rotinwa. "Oyinbo is a good thing. Oyinbo is something we should aspire to. And oyinbo is the standard worldwide." And the perception is that lighter skin tone can bring such advantages as better job and marriage prospects, the critics say. The perception is that "the darker and more 'African' you are, the less likely you will gain privilege based on your looks," says Edwin Okolo, an editor and fashion designer. "Buying creams seems like a relatively easy way to a better life." And the skin lightening products are popular. According to a 2002 survey of 450 residents of Lagos, done by the University of Cape Town, an estimated 77 percent use them. Cancelling Nivea won't change the fact that there are people actively seeking bleaching products. That's what is really concerning. One of the most widely read books in Nigeria, The Secret Lives of Baba Segi's Wives -- a humorous narrative set in the ancient city of Ibadan, some miles away from Lagos — features a character, Iya Femi, a sassy and opportunistic woman, who bleaches her skin. The bleaching doesn't go well; her skin tone becomes irregular and spotted. Still Iya Femi is incredibly proud of the light skin color. "She did it because she thought that was beauty," says author Lola Shoneyin. That hasn't always been the case, Shoneyin adds. "The way we look at people that bleached their skin in 2017 is very different from the way my mother will talk about women who use all these creams — I mean am talking 25, 30 years ago. Not that it wasn't acceptable but people who bleached their skin were regarded as women who were trying too hard to get attention."